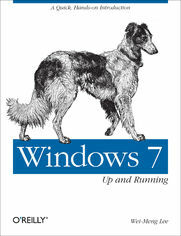 This compact book offers the quickest path for Windows users to get started with Microsoft's Windows 7 operating system. You get the essential information you need to upgrade or install the system and configure it to fit your activities, along with a tour of Windows 7's features and built-in applications. Microsoft has learned from the mistakes of Windows Vista, and Windows 7 shows it-this new OS is much faster and more stable. With Windows 7: Up and Running, you'll learn what's new and what's changed from XP and Vista, and get advice on ways to use this system for work, entertainment, instant communication, and more. Windows 7 is poised to be a big hit, and with this handy guide, you can be up and running -- and productive -- with it right away.